Birth of Baby X, and Placenta! Baby Xavier came 2 weeks early on April 7 after 19 hours of labor including 5.5 hours of pushing. He was almost a home birth... 18 hours of labor were spent at home until my home midwife proposed a transfer to a great nearby hospital known for their excellent midwives' clinic. Xavier was asynclitic and we were worried I wouldn't have any strength left to stay natural, so to be safe we left. Fortuitously, a run down three flights of stairs from our apartment to street level between contractions shifted baby's position, so by the time we got to the hospital he was ready! A 2nd degree tear and a hell of a couple of pushes more and he joyously joined us in the breathing world. [In the process, I somehow lost a ton of blood, became severely anemic, and they kept me in the hospital for a few days. All was well, though, and my partner and I were overjoyed to be joined by our son. Weighing 9lbs5oz, I was pretty happy he came early. He is a hearty eater, latched without problems, and has since gained 4 lbs! I'm so thankful that we planned for a homebirth so that I was able to labor in the comfort of my home, practicing my own management techniques for the intense sensations of childbirth, and relaxing outside the hospital environment. I'm grateful to my midwife for knowing when to make the call for transfer. And mostly, I am so so so happy that I spent so much time preparing emotionally, physically, and spiritually for this experience. I drew on some serious forces of strength I didn't know I could access to be able to push for almost 6 hours WITHOUT ANY PAIN MEDS!!! And I actually look back on the experience longingly and fondly -- oxytocin is my new drug of choice. ETA: I've updated some of the directions to make the process clearer. Also, most people advise keeping very centered and grounded during the process. The idea is that the placenta absorbs the energy around it, though not everyone is a believer in energetics! 2. 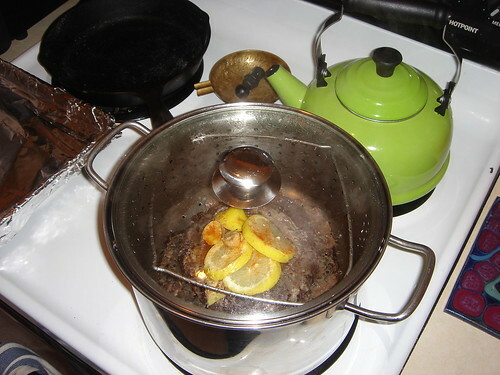 Steaming the placenta over LOW heat, with lemon, ginger, and cayenne. 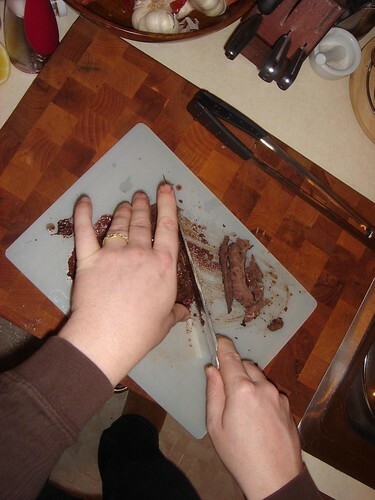 Rinse excess blood before steaming. Can also be steamed with jalapeno instead of cayenne. Steam for 15 minutes, turn and steam other side until no juice comes out. 4. Cutting into very thin slices for dehydration... The thinner the better! 10. Ready for consumption: 2 pills 3x a day for 4 weeks, then as needed. 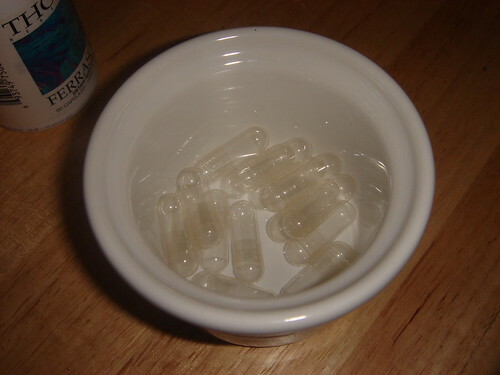 Keep capsules in cool, dry place in a dark jar. Some people recommend drinking a bit of white wine with every dose. When the mother feels she doesn't need to take the capsules anymore, she can keep the remaining ones for homeopathic use every time the child undergoes a separation from her. What a terrific guide! I never realized this was so simple to accomplish - I may just do this next time. You're welcome! 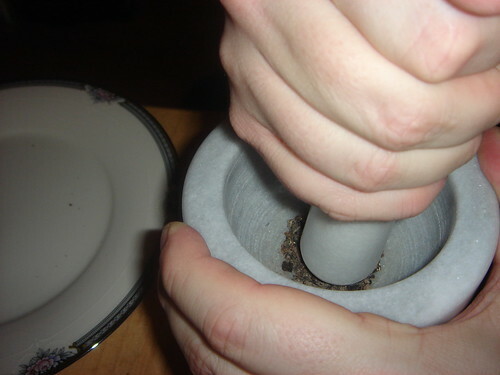 The grinding took forever by hand. My doula suggested that some people use a coffee grinder for quicker results, but the energetics, if you believe in that, might be altered. Also, the dehydration should be done on the lowest temp in your oven for 7-9 hours. Oh neat. How did it smell while cooking? I am worried it'll stink up the house. I don't know that I'll do it anyway: my placenta has been in my freezer for 13 months now and I'm not sure it's still any good for consumption. It was a very unusual smell. As my doula put it: Men are usually grossed out by the smell, and women are usually invigorated by it. I've never smelled anything like it. The house did smell a little for a few days, but we infused some essential oils of cinnamon and orange to make it smell a little more...palatable! Congrats on your birth and new baby! Wow, I'm impressed that the hospital let you take it home. Unfortunately, in South Carolina, I was told that DHEC does not allow the placenta to leave the hospital... argh. I didn't even get to see mine! I'm hoping for a homebirth next time, so I can do what I want with my placenta, lol. 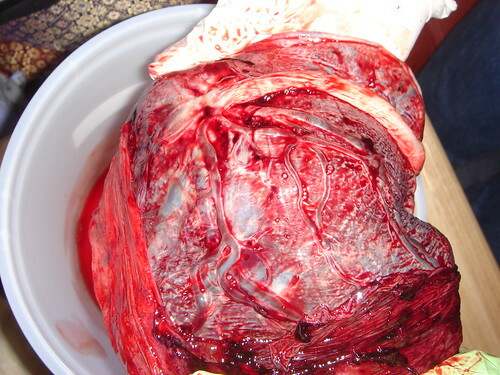 That's a great photo tutorial of how to encapsulate the placenta! Thanks for posting! I know some hospitals are really strict about it. We had to sign a waiver that we knew it was a "biohazard" etc... When my sister had her first at a different hospital, the family had to be very demanding and the nurse basically snuck it out for us! My husband won't let me name our baby Xavier :( I think it's an awesome name. Thanks! I thought Valentino would be an awesome name, but had the same problem with the non-agreeing husband :-) In this case, probably a good idea. I plan on doing the same, but I think my midwife takes care of doing the placenta and putting it into caps for me. That is one of the services they offer. That's great... My husband actually did all the grinding while I was recovering , and he had a sore wrist for days!!! 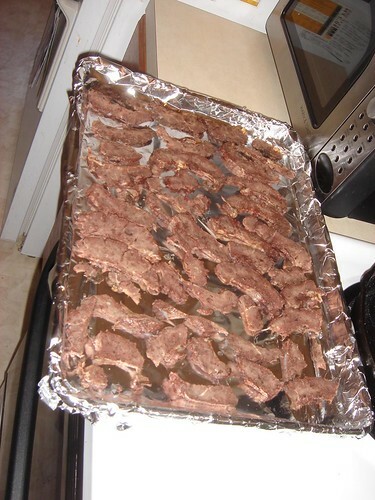 Placenta jerky is essentially what comes out of the oven... 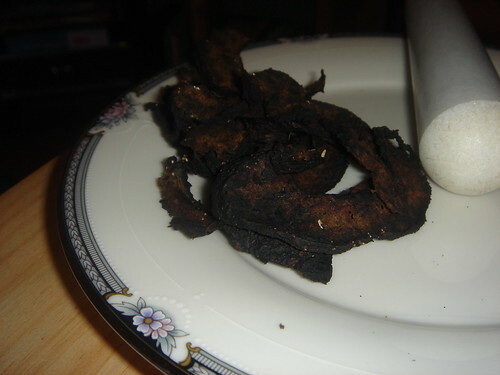 If you have a real dehydrator, even better! Happy this helps! My husband used the capsules to scoop up the powder. My doula recommended using an envelope for this, but husband found it to be an extra step. I think anything to fill up the capsules works! I found the smell to be really interesting, and not unpleasant -- just bizarre. Others didn't really like it too much. As for the lemon, ginger, and cayenne (or jalapeno), they're supposed to impart "warming" properties to the placenta as per traditional chinese medicine. And thanks for the congrats! congratulations on the successful new arrival! This was a much more palatable - and easy, because it won't go bad - way to consume it for me, too. He is just beautiful, Mama. Lovely, lovely baby. Thanks for the photo-essay! 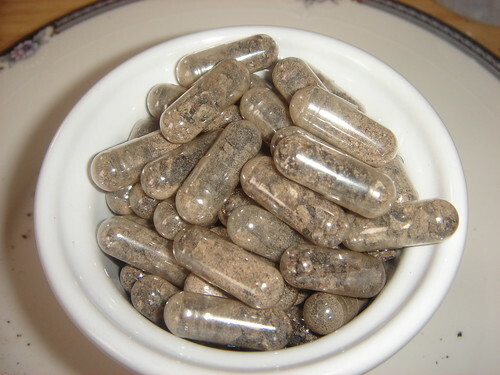 Hoe did you actually get the placenta into the capsules, though? Did you just kind scoop em up and then close it or did you use a little spoon or what? Thank you! My husband used the capsules to scoop up the powder. ypu can also use an envelope , but my hus. found it to be more cumbersome. Congrats on your birth! What a cutie! I always just assumed you had to get some proffessional or something to do this! no idea you could do it yourself. Thanks for the guide!!! It's surprisingly easy, just time consuming. It was a great post partum activity for papa! Thanks! The capsules are all vegetarian (no gelatin like some). You can find them at health food stores, made from seaweed or agar agar or something? Соngratulations on a new human being! Many happy years! 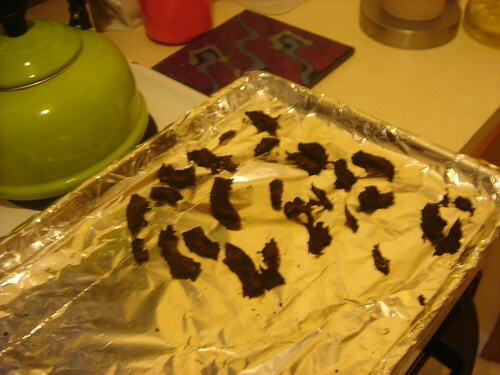 But what made you think that it was just the roasted placenta "which has been wonderful in avoiding post partum depression or moodiness, and in raising my dangerously low iron levels after blood loss"? 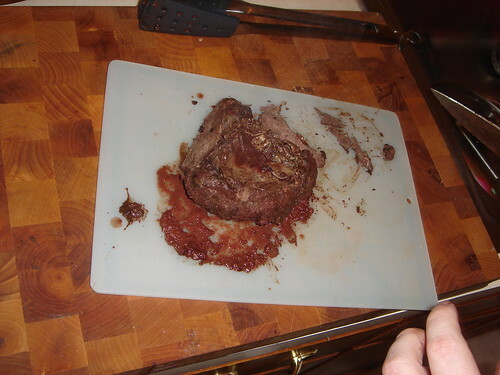 Can you cite a research about advantages of roasted placentas? Nope, but if you looked, I'm sure you could find oodles.